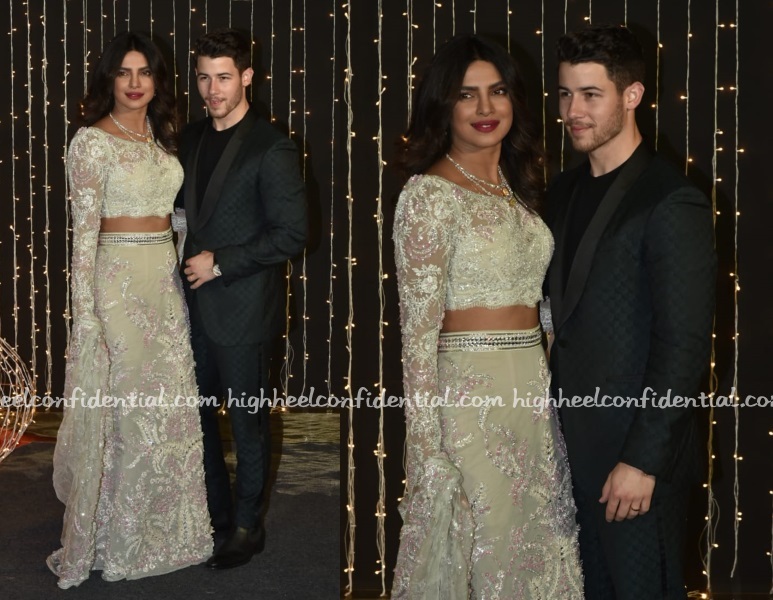 At their second wedding reception, Priyanka was seen in an Abu Jani Sandeep Khosla lehenga paired with diamond jewellery and Nick in another suit. It’s kinda old school and idk why I am really liking it. Finally something not crazy voluminous/extravagant just for the crazy pap pics that they have to change out of. It looks sleek and manageable, and the delicate embroidery looks good. Pity it doesn’t seem to photograph well in flash outdoors. If she was a guest, I would’ve appreciated the understated lehenga but as a bride, its very underwhelming. No, I don’t like it. It looks like she cut her white wedding gown to make this lehenga. Indianized western outfits again. Nick’s outfit doesn’t look reception worthy. Agree! Though I don’t mind a bride keeping it understated and light if she chooses to, this is just a fail lehenga and an unappealing fusion. Though she looks radiant, heavily disappointed with this…makes yesterday’s Sabya look 10x better. Reeeeeeally like this. Simple and elegant- both of them! Uhh ohh..noo… looks really dated.. I think she wanted to go Indo- western, but this makes her bust look weird…instead she could have opted for a gown… not liking it a bit..
Or a saree…I really wanted to see her in a saree… why the hell everyone is wearing lehenga.. this look really leaves me underwhelm. I thinks the puff shoulder blouse is making the outfit dated. My mother still has a couple of puff shoulder blouses from the early 90’s at the back of the closet and I keep asking her why did she ever buy it? It was a rage during then. The movies like Maine Pyar Kiya and all had heroines in this puff shoulder styles. But I hated it then and still do!!! It would have been a good outfit for a day time event. Not glamorous enough for a night time wedding reception party. This same outfit in a rich color would have been better. Her PR must be in facepalming ! Both of their looks is underwhelming! Guess my expectations ruined it ? Looks like this was the last available outfit in the AJSK collection given all the weddings and festivities in the last one month. And the stylist seems to be on vacation since it’s year end which explains the lackluster styling. The bride decided to wear a wig since the hair stylist also decided to take break from all the celebrations. So disappointed and underwhelmed by PC’s Mumbai reception looks. It looks like she really wanted to keep it simple, that’s all I can think of for this outfit. I wonder whether the celeb guests felt hugely overdressed standing next to her. Bride looks like a guest from the 90s and the guests look like bridezillas. Priyanka’s looks were so underwhelming, Deepika’s so overwhelming. This is shockingly bad. The colour does nothing for Priyanka. The hair looks damaged and wig like. The lengha looks like it belongs in the 90s. The fit around the waist/tummy and shoulders is off. Nick looks like he is attending a casual meeting. Where’s the tie and shirt? i am honestly baffled and mystified with this reception outfit. with ALL her resources and everything at her disposal, THIS is what she wears to her own wedding reception??? SERIOUSLY??? she shouldn’t even have worn this to someone ELSE’s reception. the lehenga looks the ugliest shade of mint green in the 1st row of pics — a color that does NOTHING for her. even in the 2nd row where the pictures look better, the lehnga is still ugly AF. Why would ANYONE decide to wear this for their wedding reception, AJSK or not? the tacky bead work, the fabric, the bad fit of the blouse/choli….such a disaster. AJSK need to retire and spare Bollywood their monstrosities in the name of fashion. as a fan of Priyanka’s I am just so so disappointed and underwhelmed. i get that she wants to keep things low-key, and she didn’t have to go overboard like Deepika’s red veil and gown, but this is just too shockingly bad. And AJSK just received some sort of a style award…oh the irony! Huh, what a difference proper lighting and camera angles make. The top two pictures look entirely different vs the bottom ones. I appreciate her choice of soft pink and not too much bling, and I can see why they thought Nick wearing a blue textured jacket would work well with her clothes, but the theory of these clothes doesn’t translate properly in how they’ve been executed. Oh, and Nick’s outfit needed a collar of some sort, and definitely not a black shirt. Seems like they couldn’t be bothered to dress up. They look so disinterested! Priyanka tried to keep all of her wedding looks understated but unfortunately she stuck to designers that can’t make good clothes. There are so many ways she could have done understated and looked amazing. As such she came out looking dated and dull in a lot of her looks. I have said it several times before and I will say it again AJSK design tacky outfits. I really really really do not understand Bollywood ladies obsession with them. For all the English/grammar nazis, my apologies for the missing apostrophe! P&P, is it possible to allow editing option for comments? I imagine it’s already been asked but just checking?! If she wanted to opt for understated breathable bridal, she should have gone to Tarun Tahiliani. This is quite underwhelming! This is such let down. Guests are dressed better than she is. I can’t even figure out the color of this outfit. It looks soft pink in some pics, whitish in others and baby blue (on some other site). I think Nick’s just over it all that he’s wearing whatever suit he has. What exactly is the color of this lehenga?? I have seen it as blue-ish in other pictures, and here it is mint green and pink. That aside, this is a very underwhelming look .. too casual! Sorry but I find Deepika, Katrina and Priyanka to be always tacky, they don’t have good taste in clothing. They are very overrated. She has been the worst dressed Bollywood bride this year . None of her outfits were nice and her make up was awful too . I don’t understand why these top designers keep designing similar kind of clothes year after year…and even worse these celebrities keep wearing them…we get so bored looking at them…don’t they want to do something deifferent..like this event Aditi went a different way and OMG what a relief she is! And there were like Anushka Sharma, Urmila, Kajal etc., who looked gorgeous in different styles.